The Blaine St stairs play such an important role in the garden. Not only does it form the boundary between the public and private sections of the garden, but it is also one of several main pedestrian corridors linking Eastlake (below) and the upper sections of Capitol Hill. People from all over the region come to use both the Blaine and Howe St stairs for exercise. While we do not have accurate counts on the number of users Ben guesses there are about 50,000 people every year who use the stairs, however, the total number of trips up/down the stairs would be much higher due to the fact that many people use these stairs for exercise and may go one direction 10-15 times. According to a 1996 Seattle Times article, ultra marathoner Jamshid Khajavi is thought to hold the record for the most number of trips up/down Howe St — 100 trips each way! Installed where the hill is too steep to drive cars directly up, stairs are frequent occurrences in Seattle. Jake & Cathy Jaramillo&apos;s book Seattle Stair Walks chronicles over 600 public stairways in Seattle — though most of them do not replace streets. The main entrance to Dan and Ann&apos;s house is off of the stairs. This connection has helped us establish a tight link with the neighborhood. Until the installation of an elevator in their house in 2004, the Blaine stairs was their lifeline to Broadway. Every thing and everyone that went in/out of the house had to go up or down the stairs. After the elevator was installed, we all continue to use the stairs because we enjoy the connection to the community and the garden. Ben has not come across any accurate dates for when the stairs were first installed. However, 100 years ago (a mere 50 years after Seattle&apos;s founding), the city was going through a renaissance. 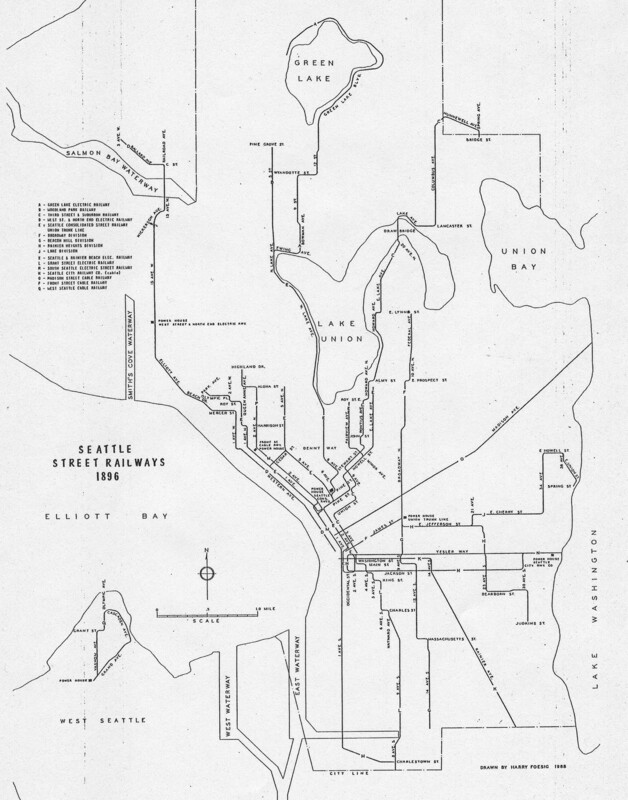 Major roads had been laid out and constructed along North Capitol Hill, and streetcar lines ran on what is now 10th Ave E, and Eastlake Ave E. There was a major bicycle system around Seattle, and pedestrians were gaining importance. Anecdotal information from Cliff Schonacker (Dan and Ann&apos;s former landlords) suggest that the first set of stairs were wooden, and likely installed in the late 1890s or early 1900s. In the coming year (2017), Ben would like to do some more research to figure out if there were stairs between Lakeview Boulevard and Eastlake Ave prior to the construction of I-5. Blaine St is named for Reverend David E. Blaine (1824-1900), one of Seattle&apos;s earliest residents. According to historylink.org Reverend Blaine founded the first church, while his wife Catharine, founded Seattle&apos;s first school. The couple was only in Seattle for three years, before moving to Portland. They returned to Seattle in 1882 for their retirement. The current Blaine stairs were built in 1910 and have had little upgrading or repairs since. Clifford Schonacker told the story that their building (1621 Broadway E) was built in 1917, originally one lot to the north. They purchased it in the mid-1920s turned it 90° so it would be facing Broadway. Ben hasn&apos;t come up with any records to support this but continues to look in the hopes of one day finding proof of this mammoth undertaking. Not only would the building have had to have been moved and turned, but several stories would have been added on the bottom because of the change in topography between the two lots. King County tax records have the building being built in 1917, so this confirms at least part of the story. In 1994 the lower sections of the Blaine stairs were threatened for destruction and re-alignment from a proposed condominium project on the south side along Lakeview. This project was seeking to move the lowest ½ of the stairs on that block into alignment with the upper section, causing the stairs to take a much steeper grade. According to an article in the July 6th, 1994 Capitol Hill Times, the developer was seeking to purchase a portion of the vacated street right-of-way so that he could include a swimming pool for the development. In order to accommodate the pool, the public stairway would have had to have been moved to the north, causing it to become steeper and more difficult to climb. Neighbor Anne Fiorella was one of the many people who were up in arms about this project. She conducted what was likely hundreds of hours of research (prior to widespread internet usage) in preparations for submitting an application to make the stairs a historic landmark. Fortunately, the Seattle Department of Engineering was not supportive of the idea of moving the stairs for a private swimming pool. To the best of Ben&apos;s knowledge, the landmark nomination form was never submitted, but the Streissguth family ended up with all of Anne&apos;s original research and have added it to our archives. When the condo project died, and the land came up for sale again (2005), the Trust for Public Land purchased it. A year later it was owned by Seattle Parks and Recreation. They were also able to purchase the matching lot on the north side of the stairs, thus securing another 0.27 acres of green space. The newly purchased lots were added to the St Mark&apos;s greenbelt and designated as forest restoration sites through the Green Seattle Partnership. One block north of the Blaine stairs is the E Howe stairs. According to Anne&apos;s notes, she learned from About those King County Place Names, by Doug Cardle, 1989, that Howe street is likely named for attorney James B. Howe (1860-1930), who&apos;s greatest claim to fame may be having a street named after him. 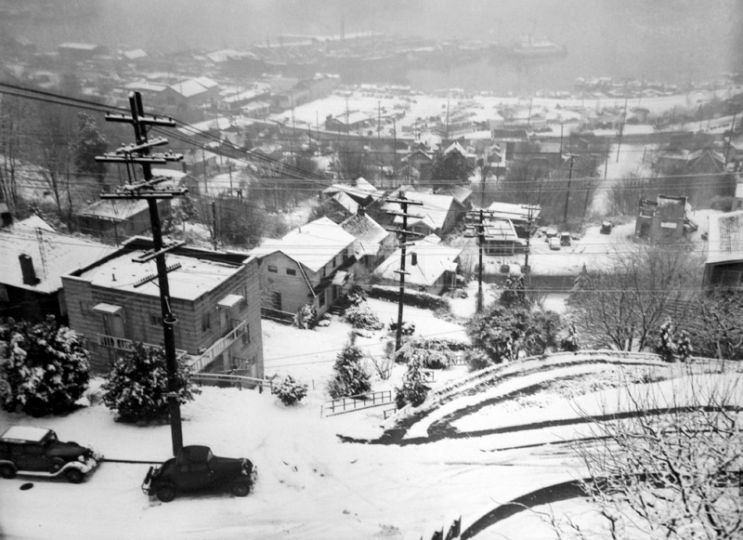 The current stairs were built in 1911 as part of a larger construction project to pave Broadway and build stairs along both Blaine and Howe. 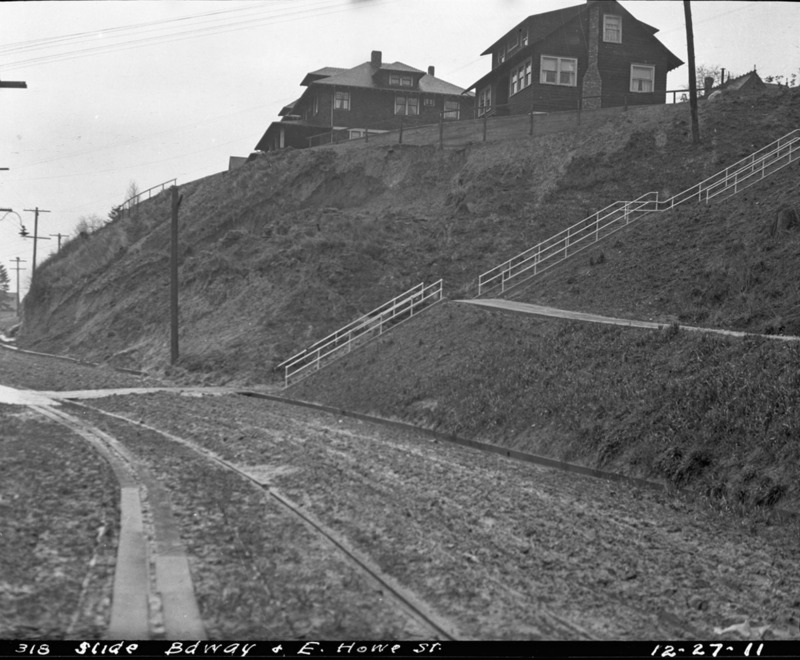 There was apparently a landslide shortly after construction (see photo) which likely resulted in all of the retaining wall, along this segment of Broadway. In 1914-15 Albert and Harriet Rhodes hired architect A. Warren Gould to build them a stately home at the corner of 10th Ave E and E Howe St. It has become known as the Rhodes Mansion. Over the years it had started to show it age, but about 10 years ago it was purchased and has been lovingly restored by its current owner. The Howe stairs are in many ways the opposite of the Blaine stairs. Howe has lovely landscapes on the section between Lakeview and Broadway, and a more wooded section between Broadway and 10th. However, the lower section of the Howe St. stairs has the distinct honor of having had several people drive down it in various cars over the past 40 years. In 2005 Colonnade Park was completed under I-5, just west of Lakeview Boulevard. The Eastlake Community Council played a major role in this undertaking. The land is owned by the Washington State Department of Transportation and leased to Seattle Department of Parks and Recreation. As part of the project, the Howe St stairs were extended to Franklin Ave E. This addition has catapulted the E. Howe St. stairs to the 4th longest outdoor staircase in the US according to publicstair.org. In 2011 CityLab listed this park in its article 9 Cool Projects Under Freeway Overpasses.